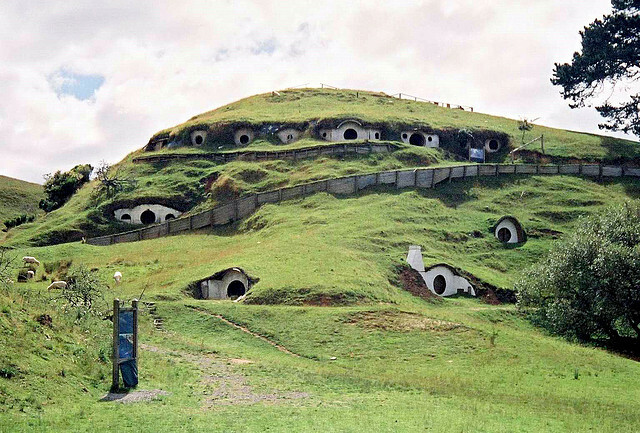 A real life hobbit village. And it’s sustainable. I remember reading an article in the St. Austin Review that described Tolkien’s Hobbiton as an embodiment of a social philosophy known as “distributism.” G.K. Chesterton was a big proponent of it. Wendell Berry—know him? You could call him one too. It’s basically agrarianism where everyone is a peasant and nobody is a lord. In Hobbiton, all the farms are for sustaining the community, not trading with the outside world at large. The mill is the closest thing to an industry, but once again it is for producing enough for the Shire. “Distributists were ‘greens’ before anyone had the label,” and it certainly wasn’t because they worshipped the earth or anything. As Christians, they believed not that all creation was God, but that all creation was God’s temple. If you only saw the Lord of the Rings movies, then you don’t know what happens in the books at the end. Remember that vision Frodo sees in the mirror of the Shire being enslaved? It happens. The ring is destroyed, but the wizard who industrialized the forest takes over the Shire. The mill makes weapons instead of corn. It’s not pretty. But this is analogous to what corporatism does to small communities. In other words, the “local, sustainable” movement, with a Christian emphasis (Tolkien was Catholic). Christians widely distribute their private property amongst one another, placing primacy on the needs of the poor—at least, when they act as Jesus wanted them to. The “rings of power” that are Big Gov, Big Biz, Big Ag, and pretty much anything but Big Hearts and Big Faith, corrupt us. Some may say that this agrarian distributism thing is nothing more than a “pastoral paradise.” That’s why it’s in a fantasy book. But the Shire only emulates a kind of community that has existed before and still exists in some places today. And “distributists think small rather than big”. Start small. This village in Copenhagen seems to have figured it out. They adapted the vision to their place and time: windmills, recycle bins. Something is pleasant in the state of Denmark. This entry was posted in Green Earth and Body and tagged agrarianism, Chesterton, denmark, distribute, distributism, farming, green, hobbit, home, industrialism, recycle, recycling, serf, sustainable, tolkein, windmill. Bookmark the permalink.